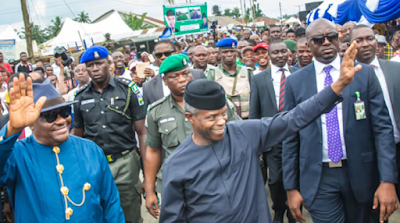 The Peoples Democratic Party has given Vice-President Yemi Osinbajo a pass mark on his performance during President Muhammadu Buhari’s medical sojourn in the United Kingdom. The party, in a text message sent to one of Punch correspondents, on Saturday, by the Chairman of the Caretaker Committee of the PDP, Sen. Ahmed Makarfi, said it was happy to hear of the President’s return. Makarfi said, “We have been praying for the President’s recovery and safe return home. Therefore, we are glad to hear the news of his return to the country. The National Publicity Secretary of the party, Prince Dayo Adeyeye, also said, “The PDP joins other Nigerians to welcome back the President, Commander-in-Chief of the Armed Forces of the Federal Republic of Nigeria, Muhammadu Buhari, from his medical sojourn in London for over three months. Also speaking on Saturday, the All Progressives Congress saluted the Vice President, Yemi Osinbajo, for leading the country well when Buhari was out of the country. The group claimed that the menace of herdsmen reduced while Osinbajo was acting president. A Second Republic lawmaker, Junaid Mohammed, also said Osinbajo deserved commendation for the roles he played during Buhari’s absence. He advised Buhari to carry the All Progressives Congress along in his government and not to sideline major stakeholders of the party. “The area he could have caused crisis was his unique interpretation of hate speech, something which is not even in the constitution not in any of the country’s laws. It was his own invention but thank God it’s not going to stand the test of time because quite a number of lawyers have condemned it. “I don’t believe Buhari could have achieved what Osinbajo did in his absence. The basic contradiction is that he is a sick man. Sick men are not assessed on the basis of their performance. But the comparison is baseless because it’s not Osinbajo who was elected.